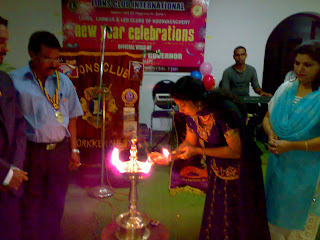 member could celebrate new year only on 9th jan 09.
club premises at mission quarters, trichur. c the above photo. miss. 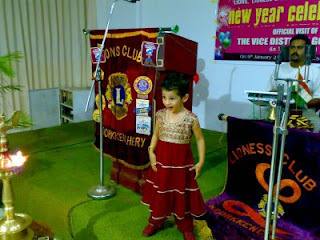 little keerthy was our youn gest dancer of the evening. please c the couple. thatz our vice district governor lion t k kishore and his spouse lioness priya. 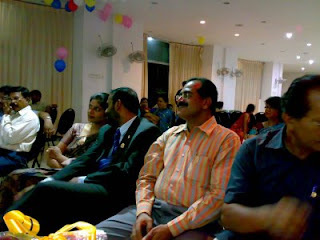 ln kishore was the chief guest of the evening. the man next to them with stripes shirt is lion somakumar who is our district ch airman for eye sight. he is a professionally qualified lawyer. yes, here comes lion ajayan. he sings with his niece. unfortunately i dont remember her name. they also performed wonderful presentation. lion ajayakumar is also a gold whole saler [ornaments made to order in bulk only] and i assume that he is the chief executive of jwellery manufacturers association @ trichur. let me c if you cou ld grab some more photos from my system. >>>>>>>>>> yes, here comes jp who is controlling the show. 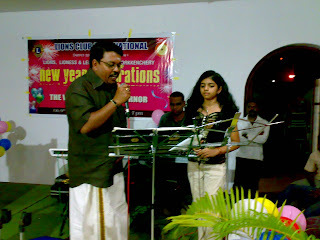 he does master of ceremony with leo sivapriya. unfotunately i could not locate her foto. he only clicked my foto. karishma who sitting next to me did not want to pose and she was benting backwards. she too came into the net. leo karishma is a good singer, but this day she did not participate as she was not feeling well. more photos to be added. but i really don't know how to layout the photos. all the photos are going on the top and it has to be dragged out to the bottom is really a messy job. i wonder if any readers of this blog could help me and teach me. what i experience from the blogging world, hardly people helps each other. i am after one kaanthary to teach me how to insert an amplifier as i have to upload some audio clips. in fact those are "kavithas" of geetha, sreedevi, tejaswini and one "thaaraattu paattu" of vijayalakshmi. all these names are bloggers and one way my colleagues in blog world. so, let me go back to lions movement. after the welocome address by the president lion k v sathyan, the chief guest was introduced by lion denny g alappat. unfortuately i could not upload his foto due to the technical issue which i stated above. then our chief guest of the day our vice district governor lion t k kishore inaugurated the evening and delivered his address. in fact cultural programms were after that. there was also mimicry by one of the young artist. he is leo kailas nath. he is the youngest boy of our lion ajayakumar, whose photo is displayed at the end of gallery. we had also a good band. i hv audio and video clips but unable upload as i mentioned the technical reasons already. we have lots of humanitarian projects in lions club. we undertake all the expenses of heart surgery for the poor. in fact i have to tell you lot of things about our lions club. you can read in this same page little more things on our club activities. in case u need to extend a chapter in your area, please contact me. our meeting was adjoured for fellowship and dinner at half past 9.
the dinner was really good. beverages were served to all the participants. specially made pastries too given to all of them along with wine. so, letz c later and i shall talk to you more about our club. MORE PHOTOS SHALL BE UPLOADED IN TWO DAYS TIME. ജേര്‍ണലിസം, ലയണ്‍സ് ക്ലബ്ബ്, ശ്രീ നാരായണ ക്ലബ്ബ്, കഥയെഴുത്ത്, തൃശ്ശൂരിലെ മികച്ച കേബിള്‍ ടി വി ശൃംഗലയുടെ ചുക്കാന്‍ പിടിക്കല്‍. എന്നാലും ഈ വയസ്സ് കാലത്ത് ഇത്രയും ആക്ടീവായിരിക്കുന്ന അപൂര്‍വ്വം ചിലരില്‍ ഒരാളാണ് സാര്‍. സാറിന്റെ ദീര്‍ഘായുസ്സിന് വേണ്ടി ഞങ്ങള്‍ പ്രാര്‍ത്ഥിക്കുന്നു. ഉണ്ണ്യേട്ടാ‍ ന്റെ ഒരു ഫോട്ടോ പിടിച്ക് തര്വോ? ?